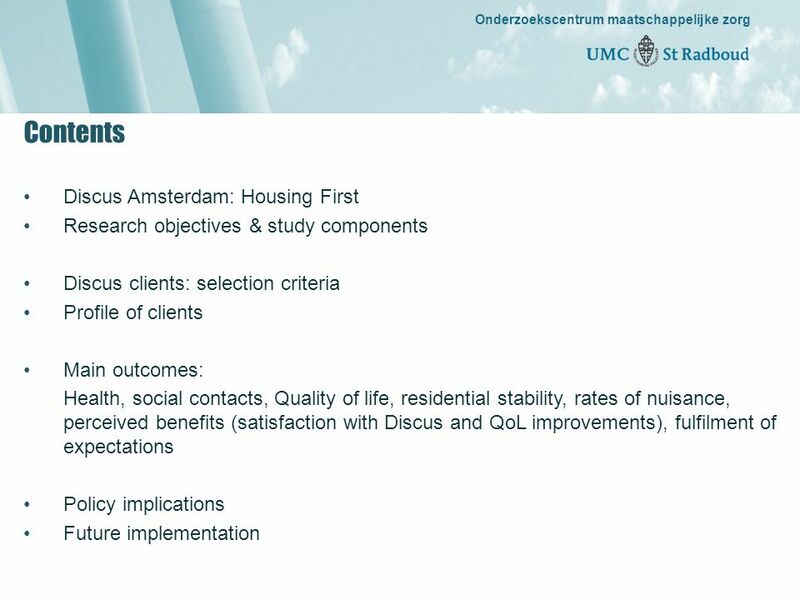 Onderzoekscentrum maatschappelijke zorg “gedreven door kennis, bewogen door mensen” Discus Amsterdam: Housing First Evaluation © UMC St Radboud Maart 2012. 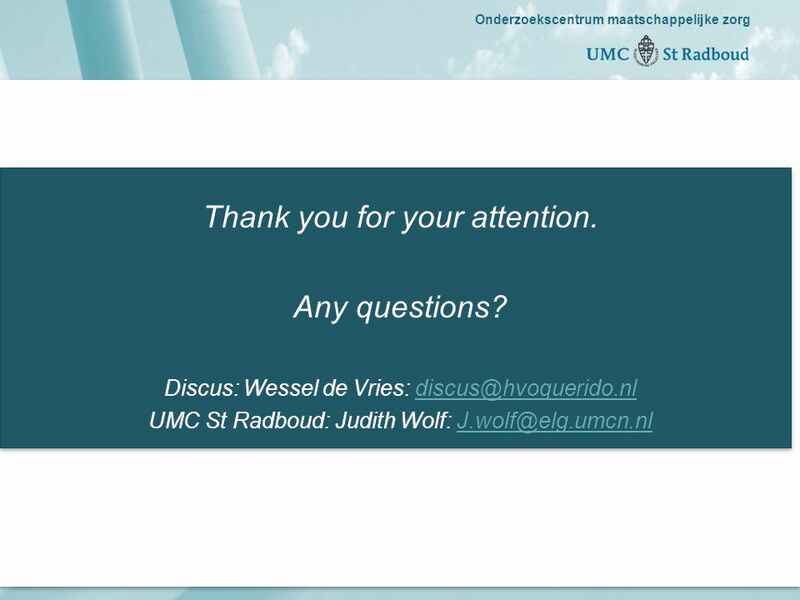 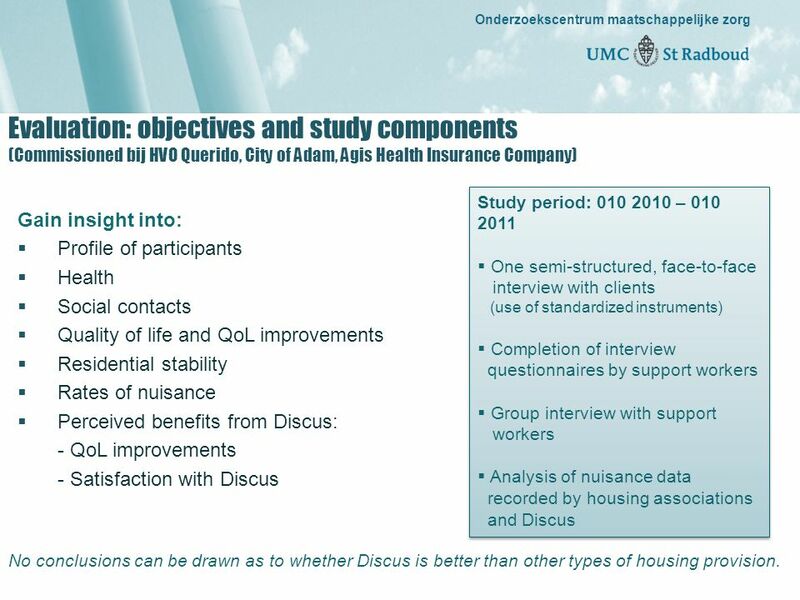 5 Onderzoekscentrum maatschappelijke zorg “gedreven door kennis, bewogen door mensen” Onderzoekscentrum maatschappelijke zorg Evaluation: objectives and study components (Commissioned bij HVO Querido, City of Adam, Agis Health Insurance Company) Gain insight into:  Profile of participants  Health  Social contacts  Quality of life and QoL improvements  Residential stability  Rates of nuisance  Perceived benefits from Discus: - QoL improvements - Satisfaction with Discus Study period: 010 2010 – 010 2011  One semi-structured, face-to-face interview with clients (use of standardized instruments)  Completion of interview questionnaires by support workers  Group interview with support workers  Analysis of nuisance data recorded by housing associations and Discus Study period: 010 2010 – 010 2011  One semi-structured, face-to-face interview with clients (use of standardized instruments)  Completion of interview questionnaires by support workers  Group interview with support workers  Analysis of nuisance data recorded by housing associations and Discus No conclusions can be drawn as to whether Discus is better than other types of housing provision. 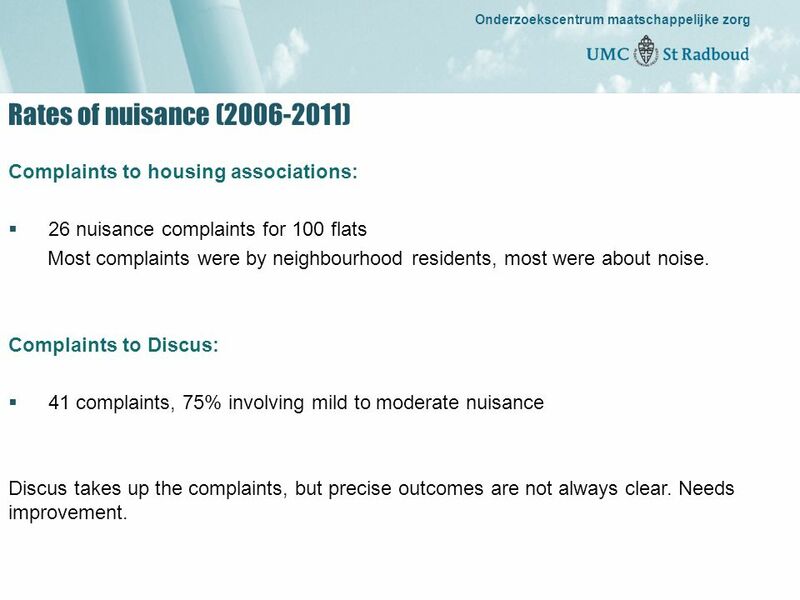 11 Onderzoekscentrum maatschappelijke zorg “gedreven door kennis, bewogen door mensen” Onderzoekscentrum maatschappelijke zorg Rates of nuisance (2006-2011) Complaints to housing associations:  26 nuisance complaints for 100 flats Most complaints were by neighbourhood residents, most were about noise. 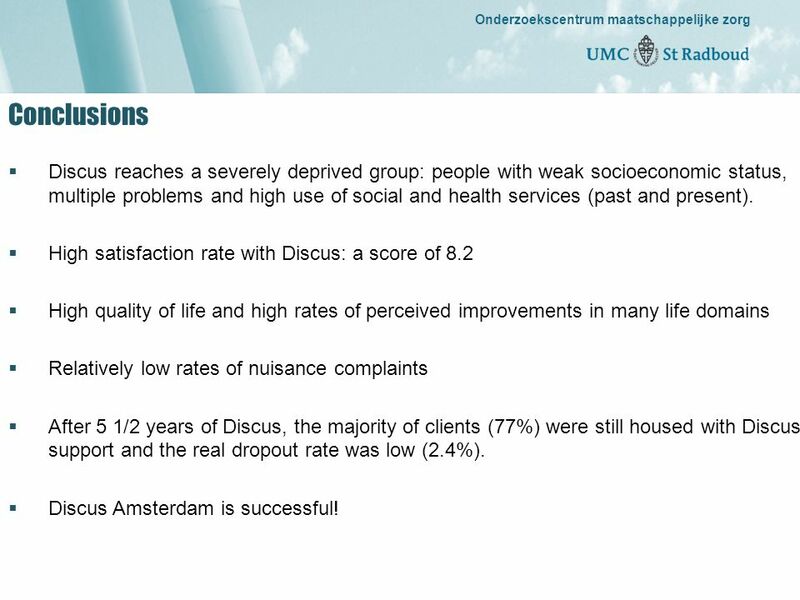 Complaints to Discus:  41 complaints, 75% involving mild to moderate nuisance Discus takes up the complaints, but precise outcomes are not always clear. 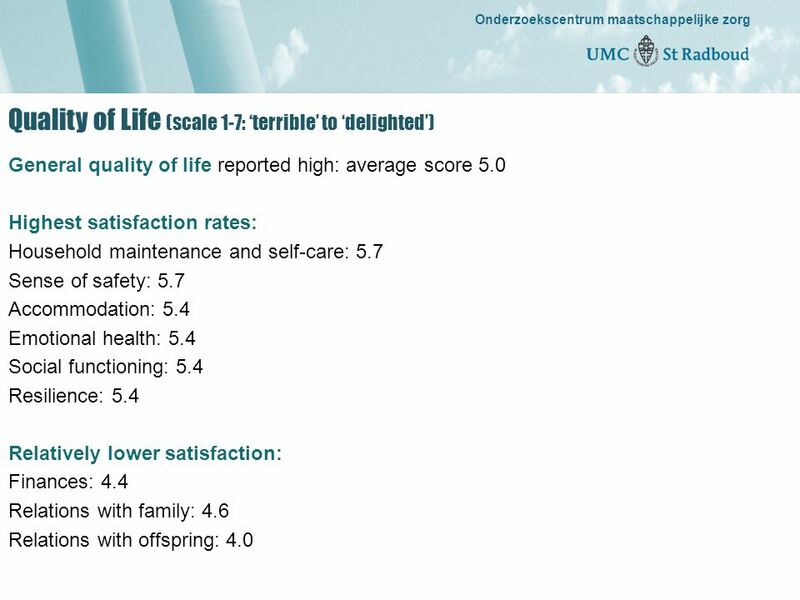 Needs improvement. 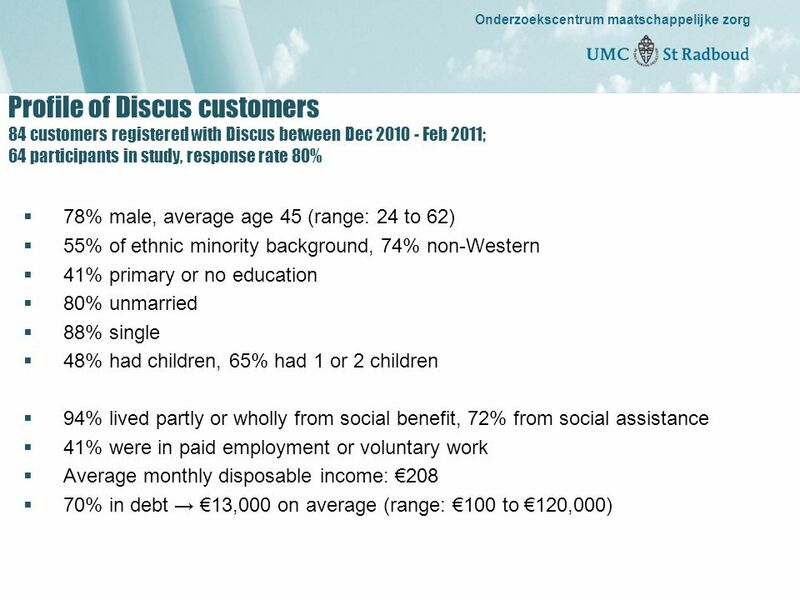 14 Onderzoekscentrum maatschappelijke zorg “gedreven door kennis, bewogen door mensen” Onderzoekscentrum maatschappelijke zorg Conclusions  Discus reaches a severely deprived group: people with weak socioeconomic status, multiple problems and high use of social and health services (past and present). 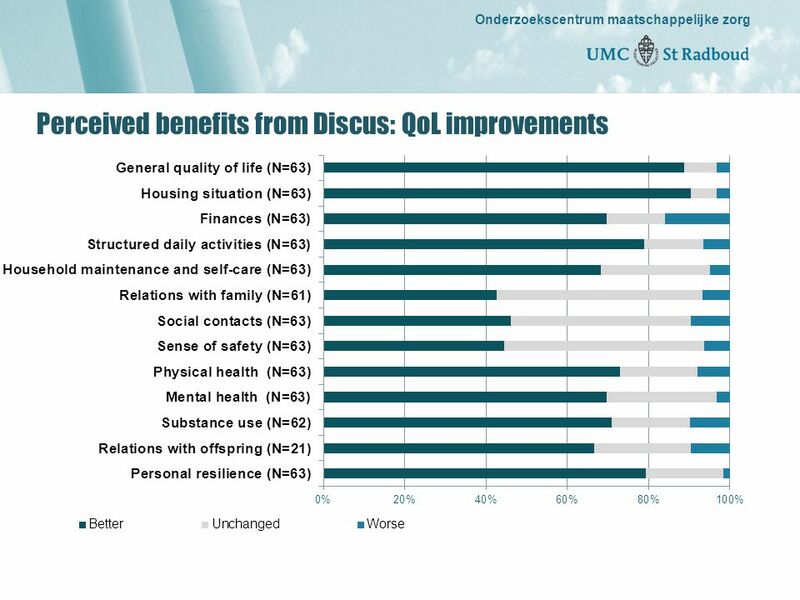 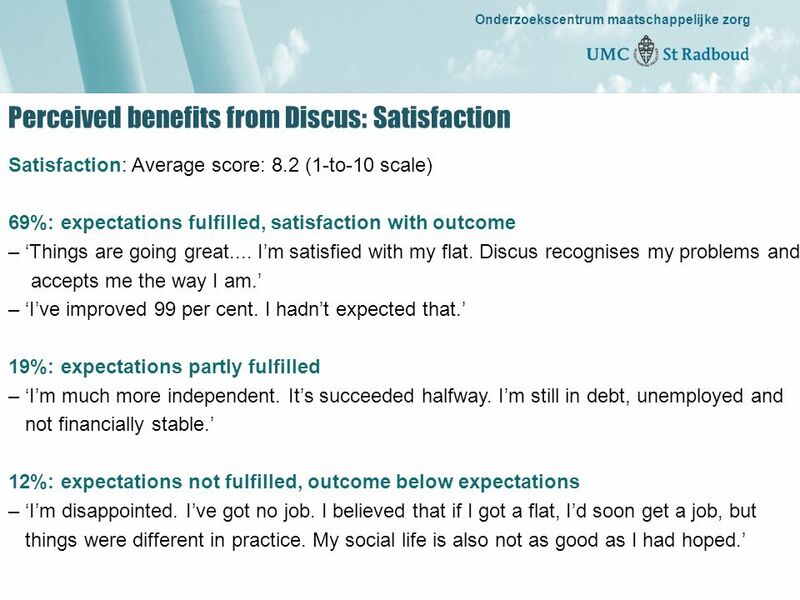  High satisfaction rate with Discus: a score of 8.2  High quality of life and high rates of perceived improvements in many life domains  Relatively low rates of nuisance complaints  After 5 1/2 years of Discus, the majority of clients (77%) were still housed with Discus support and the real dropout rate was low (2.4%). 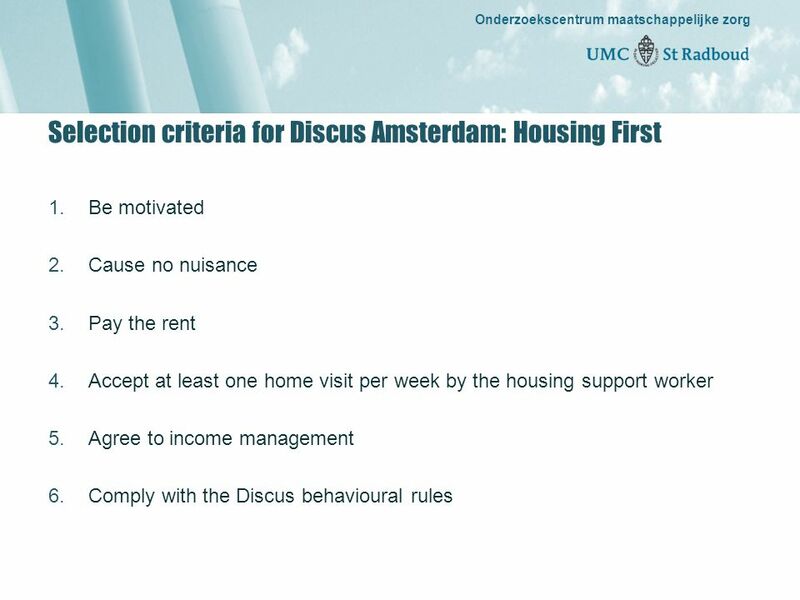  Discus Amsterdam is successful! 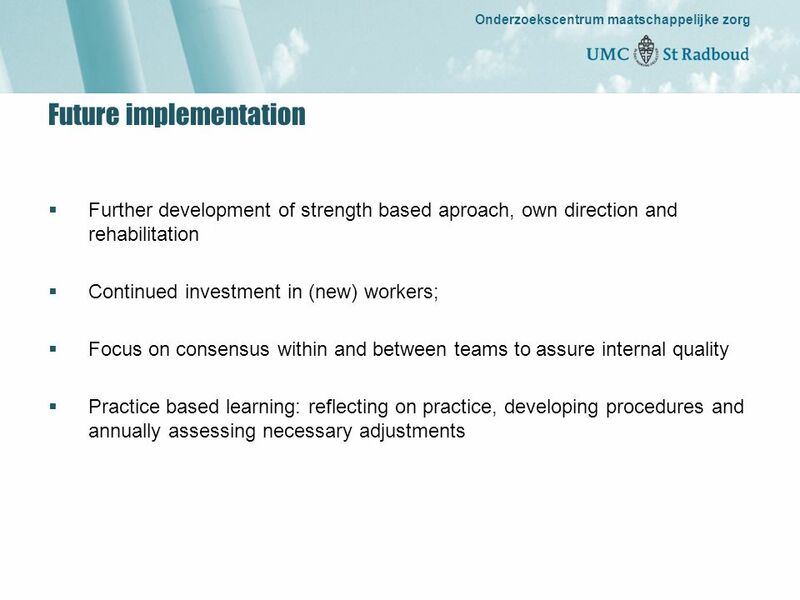 15 Onderzoekscentrum maatschappelijke zorg “gedreven door kennis, bewogen door mensen” Onderzoekscentrum maatschappelijke zorg Policy implications  Parties concerned (HVO Querido, municipality of Amsterdam, and a health insurance company) want to continue policy of extramuralisation  Invest in Housing First: health insurance company already agreed on budget for 240 extra care packages for Housing First (commitment is 300 or more)  In collaboration with housing associations 240 houses have to be made available for Housing First (and possibly more). 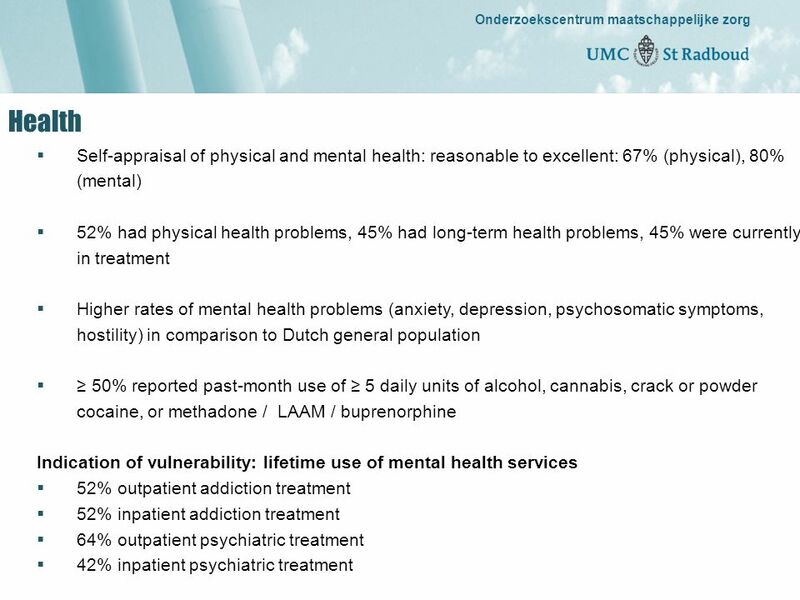 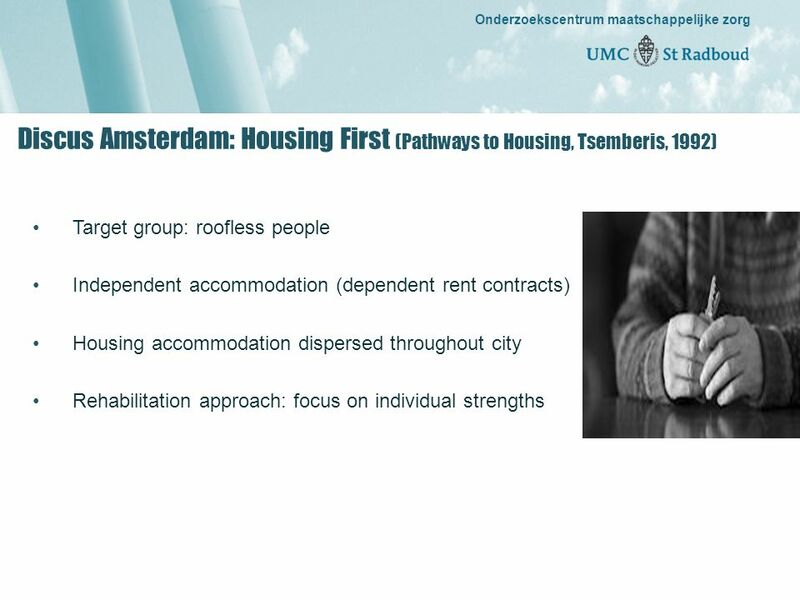 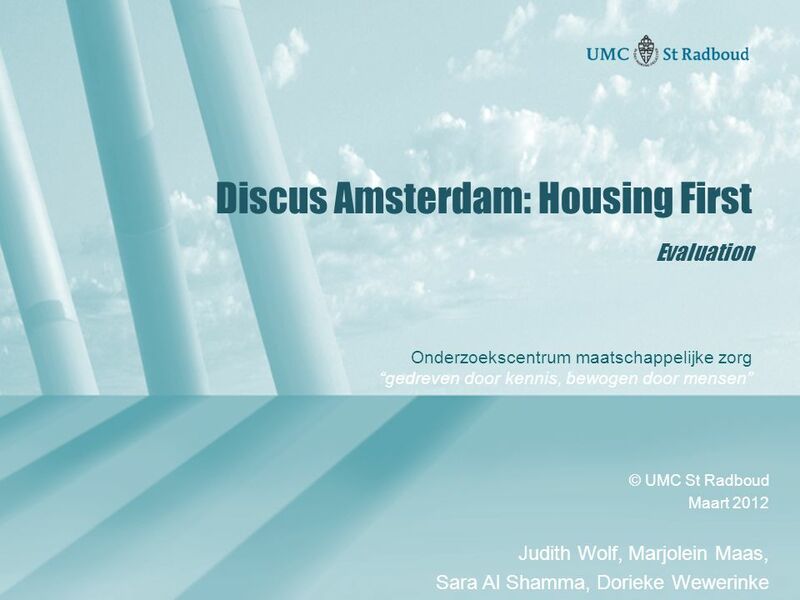 Download ppt "Onderzoekscentrum maatschappelijke zorg “gedreven door kennis, bewogen door mensen” Discus Amsterdam: Housing First Evaluation © UMC St Radboud Maart 2012." 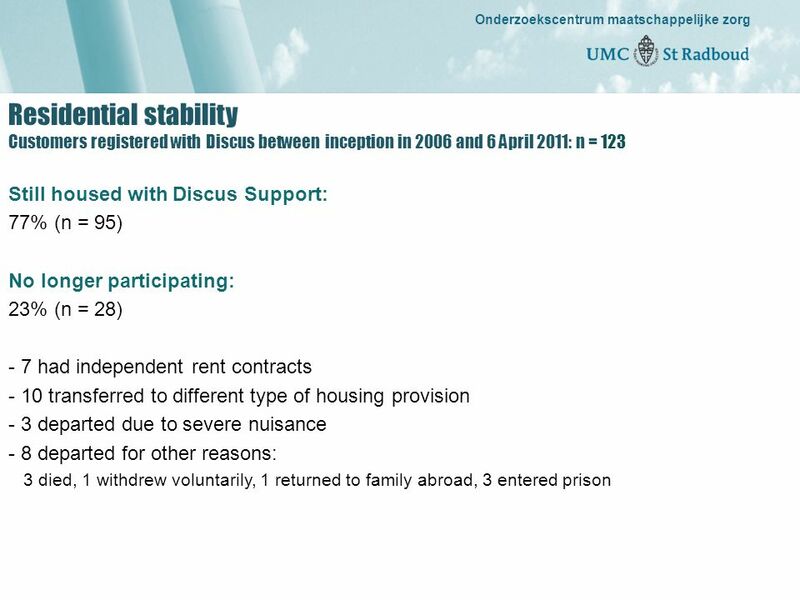 Reading Test – answers explained Class 8A Chapter 6.